With the prospect of the Canadian Men’s National team competing at home in the 2026 World Cup, Blasco pointed out the significance of the new league. The popularity of soccer on the world stage is best exemplified by the FIFA World Cup, the most watched sporting event in the world. In 2010, this tournament was captured by Spain. The Blasco family– like many Spanish families–are extremely passionate about soccer, to say the least. “I’ve always played football since I was three or four years old,” explained Blasco. “I was always with a ball. We are football fans, my dad is a very good soccer player. He got injured, but he could have played in the first division in Spain. Blasco featured for various high-profile academies growing up in Spain, such as FC Barcelona’s famous ‘La Masia’ academy that has produced the likes of Lionel Messi, Xavi, Andrés Iniesta, and many more. He then moved onto Cornellà for two years, and finally returned to Mallorca to play for the academy of his hometown team RCD Mallorca. The winger made a name for himself in Canada in the USL Championship and CCAA for Whitecaps 2 and Nanaimo’s VIU Mariners. 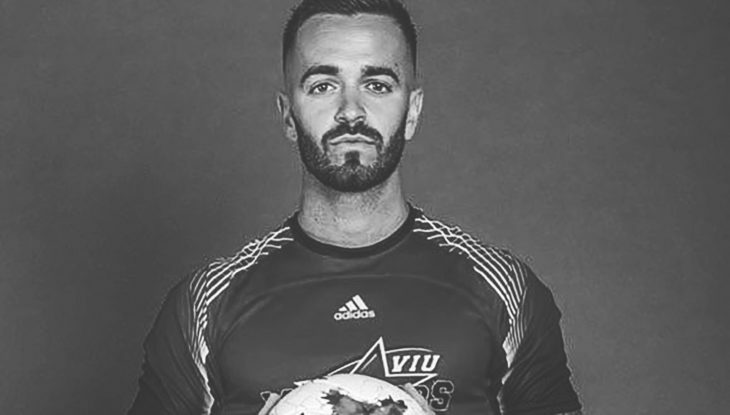 With a number of impressive seasons on his playing resume, Blasco will once again compete on Vancouver Island at the professional level of the sport. “I think that that is very cool and very exciting to represent the Island,” stated Blasco. “The club will not only represent Victoria but all of the Island. It has amazing weather, amazing people, great culture.